Sometimes watching a weather forecast is really boring. Is it going to rain? Or is it going to be sunny? What if you’re out somewhere where television and radio is unavailable and then rain starts to pour. What do you expect next? Of course, you get soaked under the rain because you didn’t expect the weather condition. How unfortunate could that be? Good thing Apple Inc. provides us with the ultimate list of applications like the Weather Apps. With varieties of weather application, it does not only give you the basic forecast but gets you more hooked up with the features where you will be knowledgeable about weather conditions. Weather applications do not only inform you weather forecast on your country but around the globe. Instant information is brought to by Weather applications with just a few touches on your iPad iPod touch, and iPhone. It gives you essential details about the present and upcoming weather conditions such as weather humidity, wind speed, dew point, temperature, UV index and visibility. 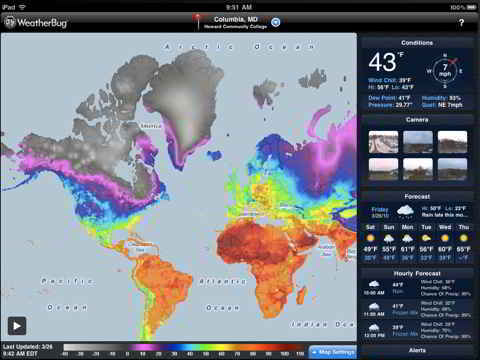 Weather HD- Find out the local conditions and forecast for any cities and any place around the globe in full HD. It gives you fine-looking animated clips of weather conditions with accurate basic weather information. Weather HD costs $0.99. Weather Clock with Alarm Tunes HD- This is a weather application that gives you basic weather forecast information. Tunes in your iPod music library can also be used as a personal alarm with fine graphics. Weather Clock with Alarm Tunes HD costs $1.99. WeatherBug Elite for iPad- It is a free weather application for iPad ($0.99 for iPhone) with fine interface that shows a map with basic weather information. It shows your location, has a seven-day and hourly forecast, shows present conditions and weather alert. Pocket Weather World HD- Consist of the basic weather information that includes GPS. It enables you to tap radar maps to display more information and multiple forecasts in different places. Pocket Weather World HD costs $1.99. Seasonality Go- It’s the most likely informative application that weather enthusiasts would love because it displays graphical information and basic weather forecast such as humidity, cloud cover, precipitation, and more. You can also organize information from the most significant to the less significant ones. Seasonality Go costs $9.99. There are more Weather applications that are useful for everyday activities with added features. Pick the most useful weather application that would surely fill the gaps of an ordinary weather forecast. Certainly these applications give us a different feel of the ordinary weather report to an extraordinary experience of deep learning with added amusement. These features are exceptionally compatible with iPad, iPod touch, and iPhone. The ultimate list of applications lives out to its title, not only to weather forecast but also to thousands of applications that are innovative, informative, factual, and unique. Now we are prepared to bring an umbrella anywhere!